Made from 28mm interlocking tongue and groove logs, pressure treated bearers the roof and floor are also tongue and groove. Includes double lockable windowed doors, two front fixed and two side opening windows and a covered verandah for shade and shelter. 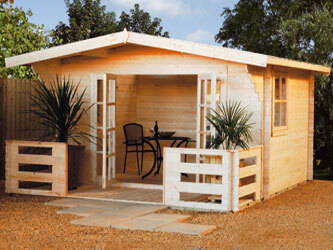 Supplied flat packed with easy to assemble instructions and supplied with fixtures, fittings & shingle roof covering. Supplied untreated.